Boozecats LOVE pizza. It is their favorite meal. One of them is sneaking a bite from that slice on the guy's face. 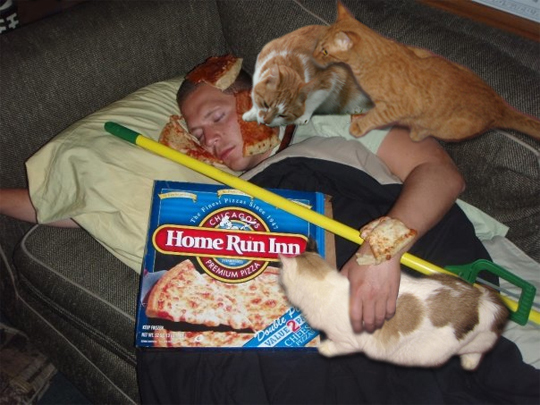 They will probably devour all of the pizza in the next few minutes leaving a mess for him when he wakes up. Luckily he fell asleep with his mop so he will be ready to go immediately. For those of you looking for a good gift for your Boozecat this holiday, I'd like to suggest getting them this game. Boozecats love PIZZA! understand such targeted about my difficulty. You are incredible!